Lyons Leaf Calendula Cream | £8.99 // I am forever searching for products that I can use on my eczema that are more natural and gives me a chance to have a break from using steroid creams. I've used products contain calendula in the past, mainly from Weleda, and it's an ingredient that my skin loves and gets on well with especially my eczema so I knew I had to try this. So far this balm is working how I hoped it would and I'm really loving it. I'm sure I'll write a full review of it at some point or include it in my next eczema products blog post. Elie Saab Le Parfum | £38 - £58 // I finished the full size of this perfume six months or so ago and completely forgot I had this mini bottle until I had a sort out and tidy of my perfume basket. I love this perfume and it's one I get a lot of compliments on when I wear it and those "what perfume are you wearing?" questions. I really missed the scent and since I'm on a no buy until I use up what I have I couldn't buy a new bottle so discovering this handbag sized bottle feels like I've shopped, when I haven't! I know this bottle isn't going to last long so I'm going to save it for the weekends and carry on wearing Stella during the week at work. Sebastian Professional Potion 9 | £24 // I bought a bottle of Potion 9 after Meg raved about it and I was going through a stage of absolutely hating my hair. Although I'm not 100% happy with my hair, I don't hate it as much as I did and it's partly down to this. It helps to enhance my natural curls without feeling sticky or crunchy but it also helps to tame frizz. My hair always feels so much softer when I use Potion 9 and I love the scent of it as well. I bought the mini tube to start off with as I wasn't sure how I was going to get on with it but I will definitely be buying the full size once it's empty. Lush The Magic Of Christmas Reusable Bubble Bar | £5.95 // This is one of my favourites from this years Christmas collection and I almost wanted to buy ten of them so I'll never be without. At least I'll definitely be buying one more in the Boxing day sales! It's a reusable bubble bar so I find I get so many more uses out of it than I do with the bubble bars you crumble up. You simply run the wand under running water until you have the desired amount of bubbles and then leave to dry out on the side of the bath until you next need it. 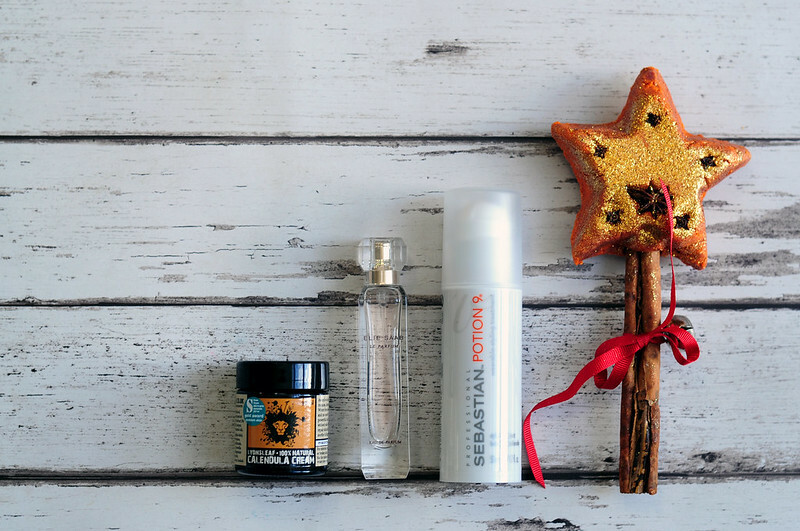 I love the cinnamon, almond and orange scent which also has a hint of clove and star anise. I need to try out that Lush reusable Bubble Bar!